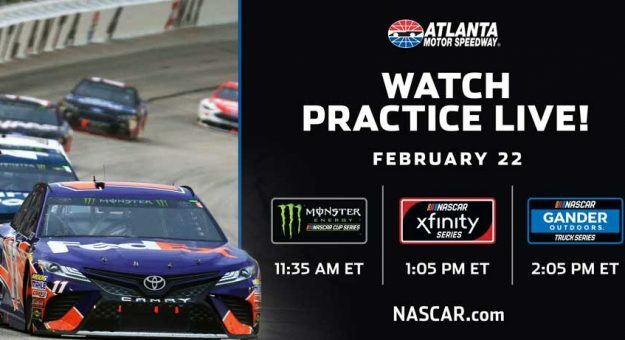 NASCAR Digital will stream live the opening practice for all three national series this weekend at Atlanta Motor Speedway when the Monster Energy NASCAR Cup Series, NASCAR Xfinity Series and NASCAR Gander Outdoors Truck Series take to the 1.54-mile track for the second race weekend of the season. Bookmark https://www.nascar.com/live, the destination for all live practice streams this year. For Friday specifically, the live-streaming schedule is as follows for users in the United States. Full practices will be posted to NASCAR’s YouTube channel later in the afternoon for fans who can’t watch live. FOX Sports will feature a multi-hour block of Fast Friday programming each race weekend, beginning at 3 p.m. ET; practices prior to 3 p.m. will be live streamed on NASCAR.com. Host Sara Walsh anchors Fast Friday this weekend, with analysts Ricky Craven and Jamie McMurray. The Xfinity Series and Gander Outdoors Truck Series has a planned doubleheader on Saturday, with the Xfinity Series race starting at 2 p.m. ET and the Truck Series race following at approximately 4:30 p.m. ET. Both races will be on FS1. The Folds of Honor QuikTrip 500 concludes the weekend with a 2 p.m. ET start time, Sunday on FOX.